On 9th May, 2016, Runcie C.W. 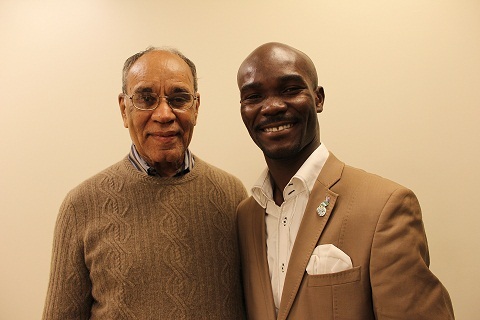 Chidebe, the Executive Director of Project PINK BLUE was in New York for a meeting with Dr. Harold Freeman, the father of Patient Navigation Program (PNP) and founder Harold P. Freeman Patient Navigation Institute in New York, USA. The goal of the meeting was to conclude the partnership between Project PINK BLUE and Harold P. Freeman Patient Navigation Institute on the training of patient navigators in Nigeria. Dr. Freeman has been working on Patient Navigation Program since 1990 and this idea has revolutionized cancer care in the U.S. and other part of the world. Bringing patient navigation program in Nigeria will help cancer patients, and the general public with guide to cancer care. He was also at the Palliative Unit of UT MD Anderson Cancer Centre, Houston, USA to discuss a partnership on training of retired midwives/ nurses who will provide the palliative care to women with metastatic breast cancer in their communities. A cancer diagnosis often brings with it fear, stress, distress and a lot of questions. So many women get frustrated when diagnosed with cancer because of the difficulty in the process of assessing care for cancer; sometime, they abscond without any trace. A Cancer Patient Navigator can help. They are trained oncology nurses, retired midwives and passionate social workers that provide cancer patients and their families with support throughout the cancer journey. The cancer patient navigation program uses a Telephone Centre with customized phone number where the general public can call to speak with the patient navigators who will help them through their diagnosis, treatment, post-treatment and support. It is a confidential and individualized assistance offered to cancer patients, families, and caregivers to help them overcome health care system barriers and facilitate timely access to quality medical and psychosocial care from pre-diagnosis through all phases of the cancer care experience. It is the type of care afforded to people from the time a lump is discovered through screening, diagnosis, surgery, radiation, chemotherapy, survivorship or end-of-life care. Project PINK BLUE launched the Nigeria’s first Patient Navigation Programme on 4th February, 2015, during the World Cancer Day commemoration, after they discovered the frustration women face when diagnosed with breast cancer and also that there is no single Telephone Centre on cancer care and support. Currently, the programme is supported by Union for International Cancer Control (UICC) and Pfizer Oncology in partnership with the Federal Ministry of Health. On 24th March, 2016, a Strategic Planning Meeting was held with twenty (26) stakeholders and Dr. Ramatu Hassan, the National Coordinator of National Cancer Control Programme (NCCP) expressed the support of the government for the initiative which is the first patient navigation programme. On 30th of March, 2016, one hundred and fourteen (114) retired midwives, nurses and social workers were sensitized on Breast Cancer Navigation and Palliative Programme (BCNPP) at the Trauma Centre Auditorium of the National Hospital Abuja. Prof. Ifeoma Okoye, a renowned cancer control advocate and professor of radiology, made a presentation on “Nurses as Change Agents in Advanced Breast Cancer in Nigeria”; Mal. Umar Aliyu, the Deputy Director Nursing School, National Hospital, made a presentation on “The Relevance of Nurses in Advanced Breast Cancer Care in Nigeria”; and Runcie C.W. Chidebe, a cancer control advocate and the executive of Project PINK BLUE, made a presentation on “Breast Cancer Navigation and Palliative Programme.” There were also panel of discussions and series of break-out sessions such as Focus Group Discussion (FGD) to discuss the patient navigation programme and caregivers burden. Project PINK BLUE is also facilitating a monthly online training with University of Texas MD Anderson Cancer Centre project known as Palliative Care ECHO in Africa (ECHO). The monthly online training meeting using Zoom Us provides a platform for Palliative Care nurses and retired midwives to share experiences and learn from the counterpart in other part of the world. On 16th June, 2016, sixteen (16) retired midwives and nurses joined the training meeting and had an insightful discussion on “Case presentation”. It is believed that this first patient navigation programme in Nigeria will make a lot of difference in connecting people at risk of breast cancer and people already diagnosed with breast cancer to where they can receive care, treatment, support, oncologists, referral, and other needs. As a pilot project in Abuja, it will create a platform for expansion to other states in Nigeria.